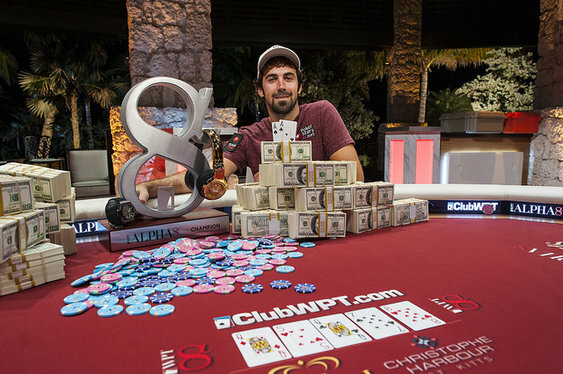 Jason Mercier has another big victory to add to an already packed tournament CV after taking down the latest WPT Alpha 8 Super High Roller. The Team PokerStars pro topped a field of 15 entrants in St Kitts who were battling for an impressive prize pool of $1,455,000. Eleven players started the final day in the Caribbean resort with Mercier getting an inkling that things would go his way after eliminating the super-hot Daniel Colman early on. Poker's Phil Hellmuth-basher-in-chief ooked set for a double up when all-in with AK against Mercier's AQ. A queen on the flop gave Mercier the early boost and sent the WSOP One Drop winner to the rail. Mercier then safely navigated his way through a stacked fine nine that included Talal Shakerchi, Antonio Esfandiari, Alec Torelli and Bill Perkins. When start of day chip leader Olivier Busquet busted in fourth it was left to Mercier, Tony Guglietti and Kathy Lehne to scrap for the cash. Guglietti was the first to go, losing a kicker battle to Mercier when both players had top pair. The first women to play in a WPT Alpha 8 came tantalizingly close to winning but Kathy Lehne would eventually fall just short. The final hand saw Lehne check-shove on a Qd5hQc7s8h board. Mercier took his time to make the call, eventually tabling pocket aces which was good enough to crush Lehne's 10h8d. The $436,000 runner up prize marked a great return for her debut Alpha 8 performance. And for Mercier, there was another $727,500 to add to his bankroll as well as a pair of Monster 24K headphones and a Hublot King Power Unico watch. The WPT Alpha 8 caravan heads to America for its next stop with the Bellagio in Las Vegas for next week's $100,000 buy-in event.